On Squam Lake in Holderness, NH is tucked a ‘frozen-in-time’, pristine setting. Rockywold-Deephaven Camps have been around since 1897. The quaint cabins, each with their own fireplaces and docks on the lake, offer just the right mix of comfort, inspiration, relaxation and awe. Please join us for this unique and wonderful opportunity to experience Rockywold-Deephacen Camps, Squam Lake, the spirit of community, kayaking, hiking, wonderful food, and an inspirational all-inclusive program of Reiki activities and Shares. Cost: $160 ~which includes manual, training, attunement, certificate of completion, hand-made journal, Restorative Reiki session, and gifts from Peace of Mind. The benefits of a personal Reiki practice can stretch into all areas of our lives, bringing improved comfort, health, balance and clarity to the full spectrum of what our lives hold. 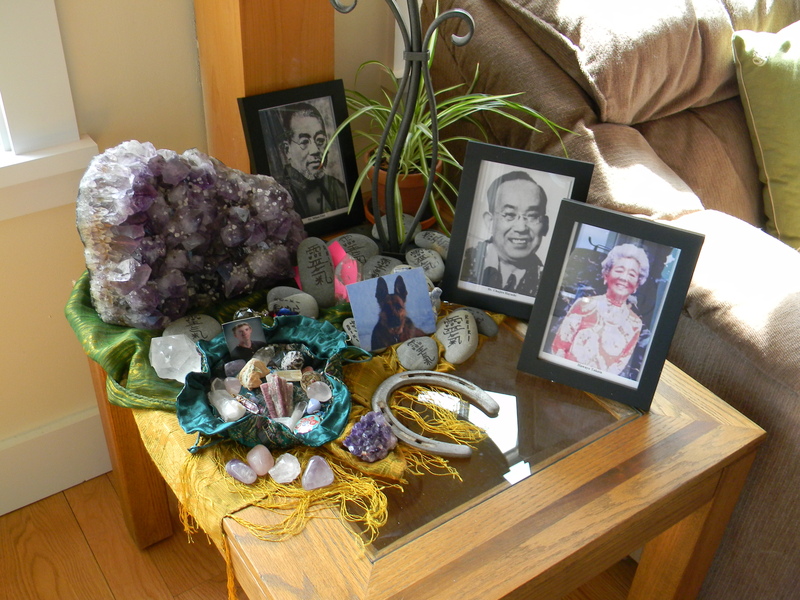 Peace of Mind Reiki’s beginning level Reiki training will support a strong personal foundation in Reiki. Join us to explore and gain a thorough understanding of Usui Reiki (and its progression to current times), personal skills and tools to enhance your body’s innate wisdom to balance and heal, and be attuned to the grace-filled energy of Reiki. Along with learning of the history and training, we will incorporate meditations, journaling, lecture, silent walks, a Restorative Reiki session, and plenty of practice time for you to feel secure with this first stage of a Reiki Practice. 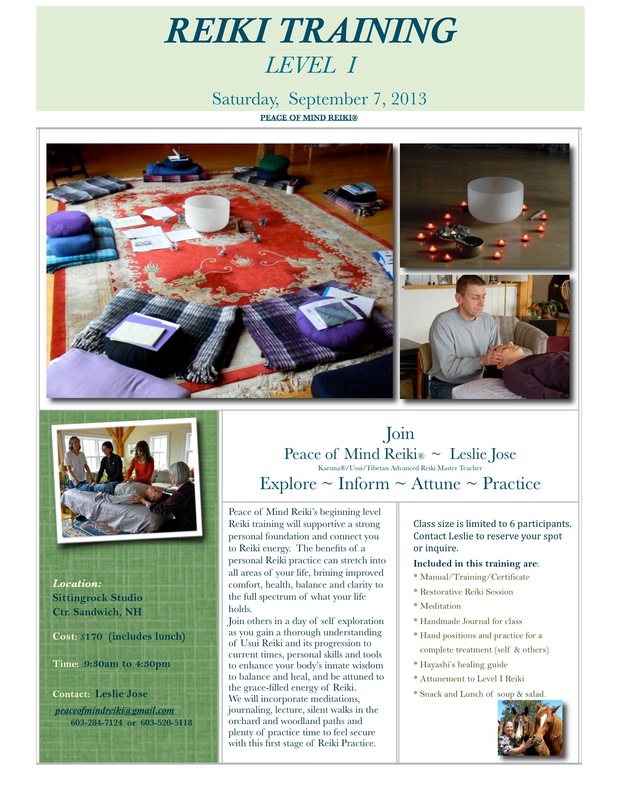 All participants will receive Reiki I certificates and gifts from Peace of Mind. Email or call Leslie to register. Contact Leslie for dates, supplies, and location. * Reiki aura clearing * crystal clearing * learning of and creating a crystal grid * attunement to the master level vibration (you’re attuned to the higher vibration of the master symbol. This strengthens and enhances Reiki energy. However, the actual attunement and training to use the master symbol is part of a master level training ) * meditation to more fully connect your chakras with Reiki energy * journaling * a review of Reiki and new information * clearing old habits, instilling new ones * supports to keeping oneself clear and balanced. 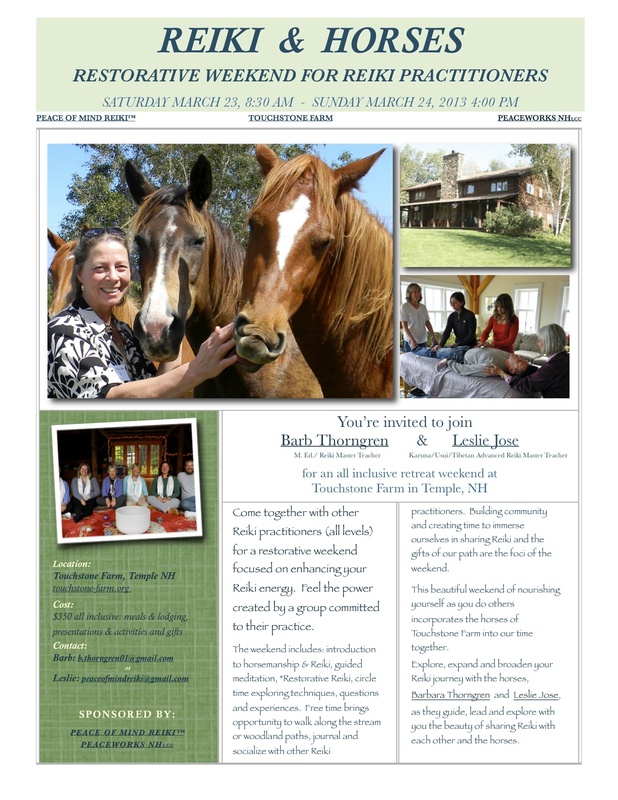 Basic horsemanship/safety and handling will be presented along with a weekend of sharing and exploring Reiki with each other and the horses. Meditation/journaling/networking and fun. A powerful journey connecting with yourself through the wisdom within the Equine world and Reiki. For details and up coming dates contact Leslie. 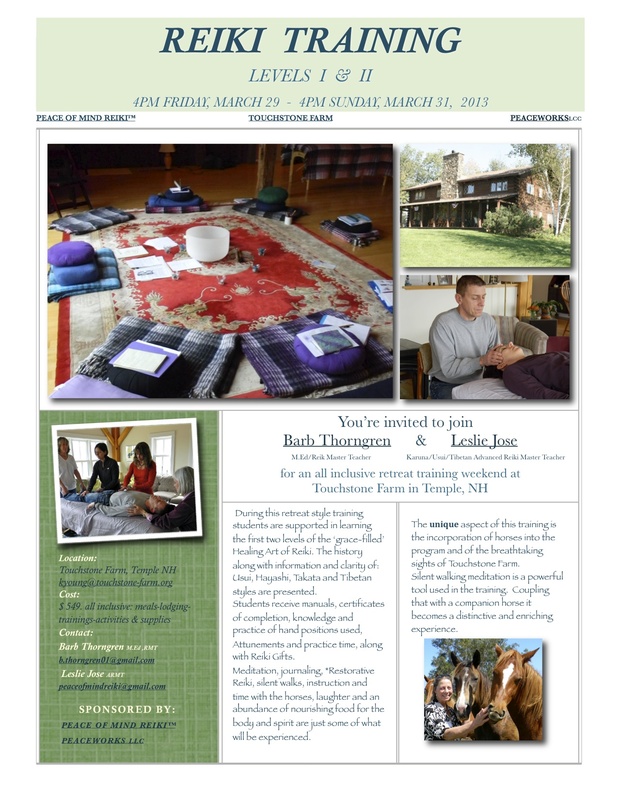 Details are here: March 23 -24 2013 at Touchstone Farm. All inclusive weekend for Reiki Practitioners (all levels/all lineages). 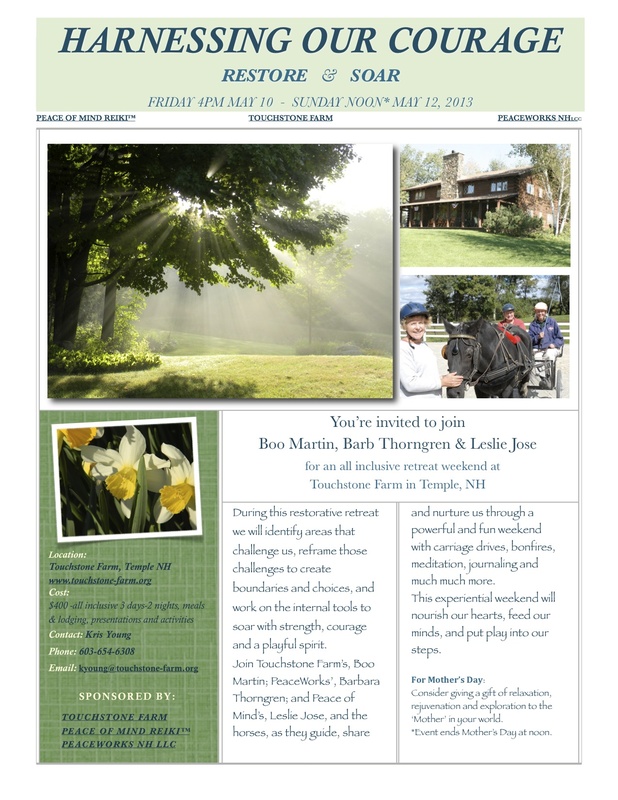 $350 covers meals/lodging/activities/presentations and more. For all the information call or email Leslie at peaceofmindreiki@gmail.com. or click on the link below to read details about our up coming weekend. Click on the link to the left to visit Touchstone Farm’s Website. 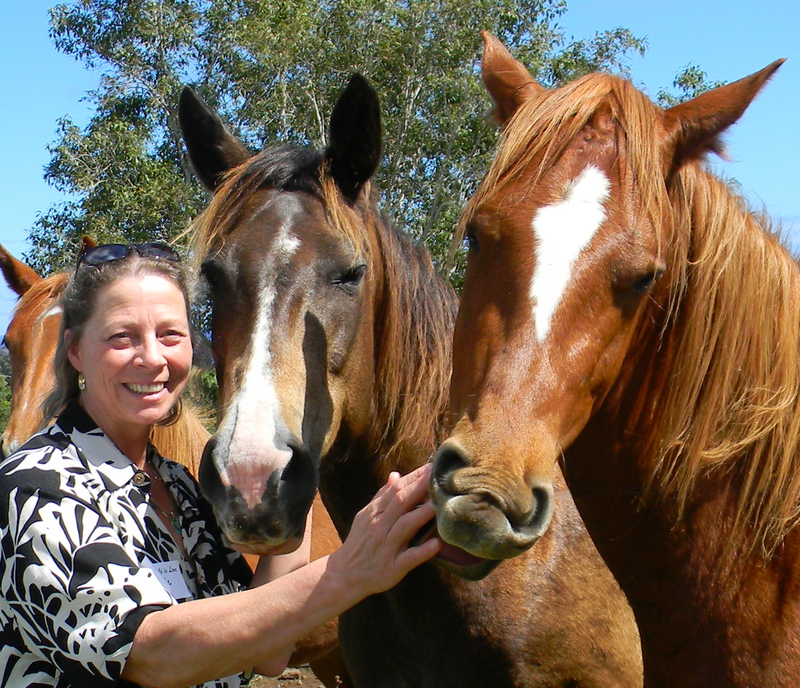 Join Leslie, Barb and the horses at Touchstone Farm as they guide and nurture you through learning the first 2 levels of Reiki. click the link to read the details of this unique and wonderful weekend. Can you help my paw? $170 for each day includes: Training, manual, atunement, certificate, tea/coffee/snack/lunch, Restorative Reiki session, journal, and gifts from Peace of Mind. 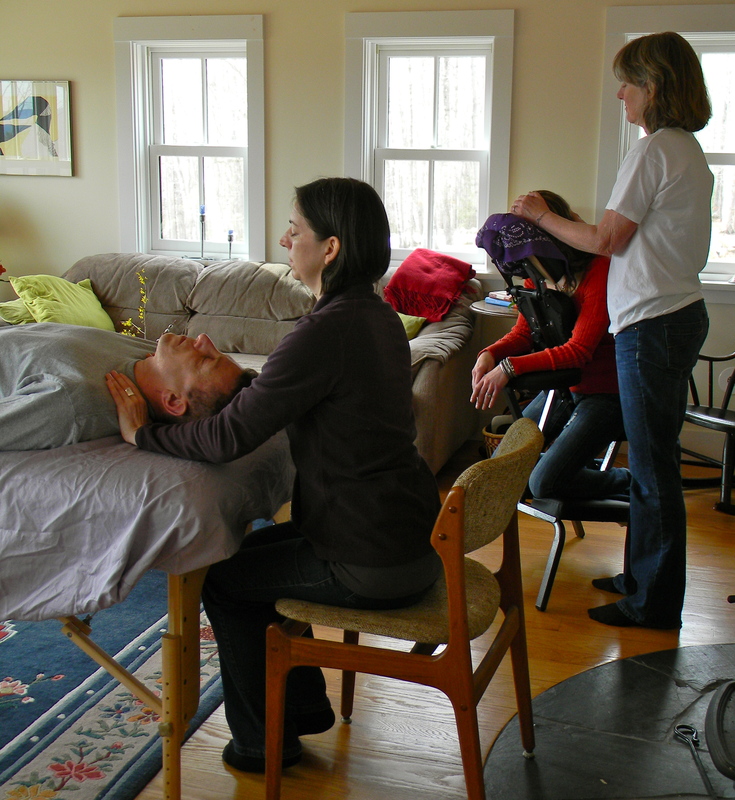 TBA: Advanced Reiki Class, Level III/Master Class, and a full day Reiki Share in Whiteface Interval. 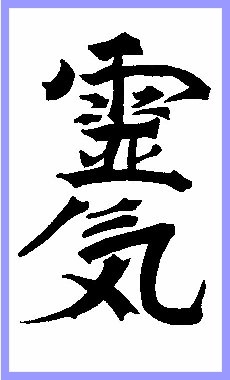 Peace of Mind Reiki™ holds two styles of trainings. 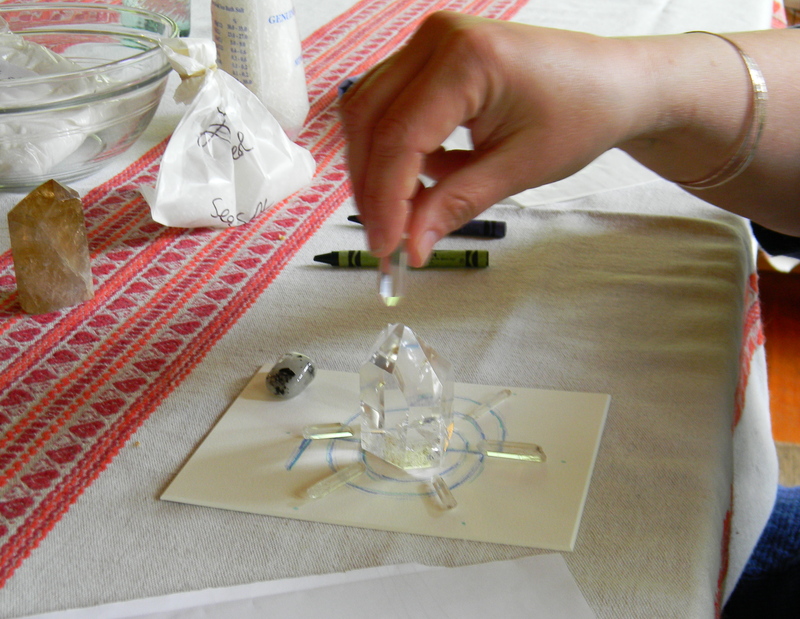 Workshop style trainings are held on a Saturday (Reiki I) and a Sunday (Reiki II). Next workshop training is June 2nd and 3rd 2012. Contact Leslie for specifics. We surround ourselves with the love and light of Reiki and each other, while learning the tools to bring this beautiful healing art into your life. Each day includes morning tea and goodies, training, lunch, manual, certificate of completion, journal, meditation, silent walks, practice time and Reiki gifts. $170 per day. Contact Leslie for more information. Leslie Jose, Karuna®/Usui/Jikiden Advanced Reiki Master Teacher brings her life experiences, training and passion for the gifts and beauty of Reiki to these unique and rewarding trainings. Arrive between 4 -5 Friday for registration, opening circle, dinner and a group Restorative Reiki session given by Leslie. Saturday morning begins with breakfast and a yoga class, then Reiki Level I Training and practice. 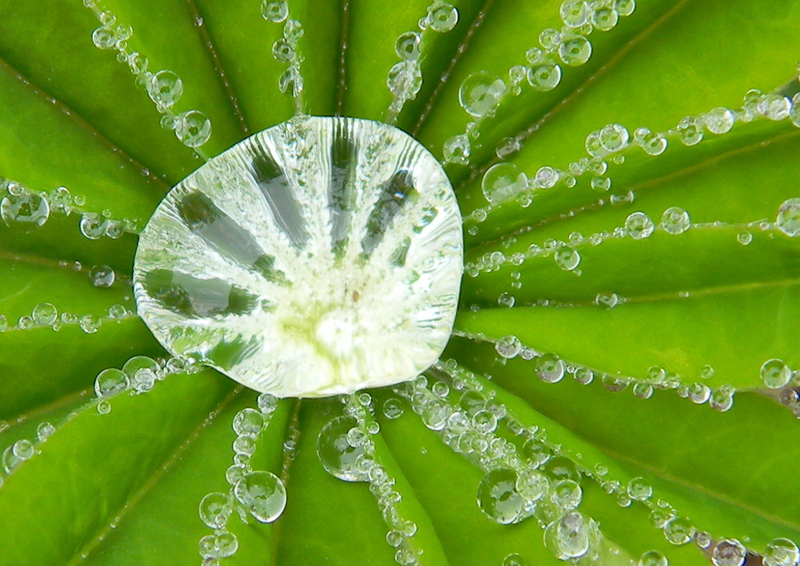 Our intention is for you to tap into yourself and resonate with the light and love of Reiki. Guided journaling, meditation and walks along the river support the journey of receiving Reiki into your life. Following dinner we’ll begin Reiki II training and end with the evening event. After breakfast on Sunday we’ll continue our Reiki training and practice, concluding the weekend with a closing ceremony at 3pm. In your free time enjoy the spa, wander the river and marsh trails, meditate in the beautiful loft, read on the back porch, or practice with new friends. 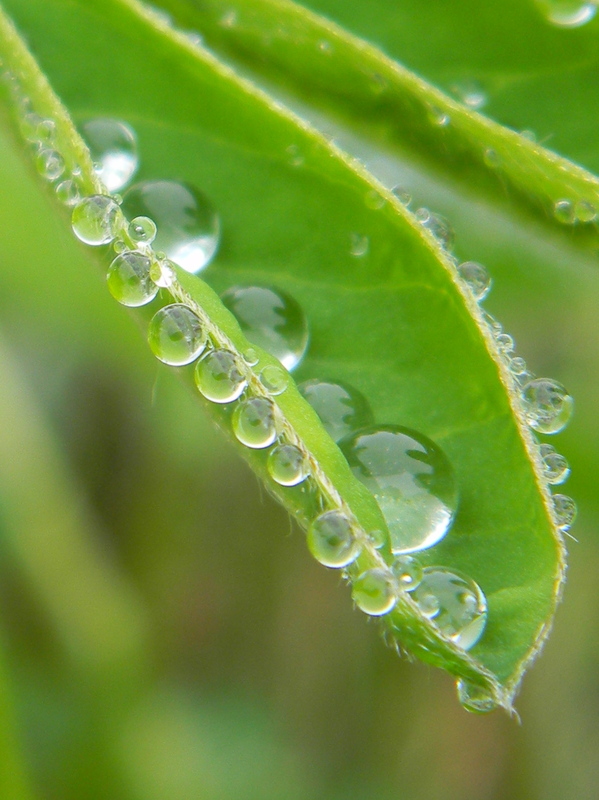 This retreat and training opportunity bring the participant something special. Even those already trained in Reiki will find this retreat an outstanding opportunity to refine and increase their understanding and practice. There are many opportunities to receive Reiki training, but few seem to offer the tools and practice of “incorporating” that training into your self, into your life. We spend quality time identifying those self tools and bringing them into playful/soul-filled windows to incorporate Reiki into your life. The weekend activities are enhanced by our time in the magnificent surroundings of the White Mountains of NH. Nurture your spirit in ways that are life changing. Participants will return to their routines with a confident sense of self and the powerful gift of Reiki, a detailed manual to refer to, several special gifts from Peace of Mind, a personal journal, and tools to support yourself along your journey. Don’t miss this unique opportunity. 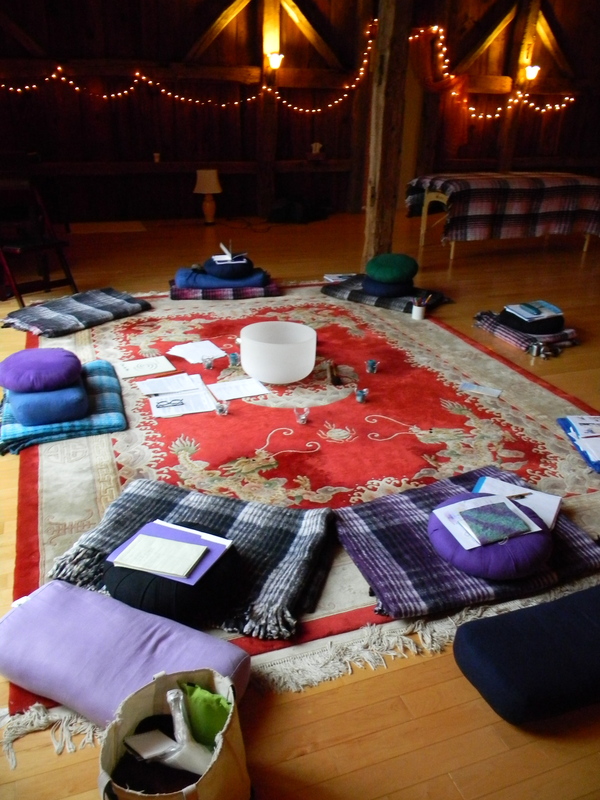 All-inclusive includes Reiki Level I & II Training, manual and certificate of completion, hand crafted journal, all meals, full use of the facilities and grounds, Friday night Restorative Reiki session, Saturday morning gentle yoga class, and the ever-present and amazing view of the White Mts. and surrounding landscapes during one of the most stunning weekends of the fall foliage season. Call Leslie or email Leslie directly to register or for more information. It is a pleasure reading and absorbing the light and wisdom you bring to others with your blog and articles. I encourage others to visit your site.